Preliminary autopsy results show that a St. Louis teenager killed by police on Wednesday was shot in the back. The medical examiner’s findings appear to contradict the police, who said that officers opened fire after the teen pointed a gun at them. Ball-Bey was African-American. Both officers involved in the shooting are white. Some 150 protesters gathered at the scene on Wednesday evening. When police tried to disperse them, the protesters threw rocks and bottles. Police responded with tear gas. A car and a house were set on fire, and nine protesters were arrested. While the autopsy could not determine whether way Ball-Bey might have been twisting around when he was shot, “he certainly wasn't facing, his chest wasn't facing the officers," Graham said. According to the St. Louis Police department, two men fled from officers executing a search warrant at a house in the crime-ridden neighborhood of Fountain Park. One of the men, later identified as Ball-Bey, reportedly pointed a gun at the officers, who shot four times in his direction. A handgun recovered from Ball-Bey had one round in the chamber and 13 more in the magazine. Three more guns and an unspecified amount of crack cocaine were found at the house. The autopsy’s findings seem to contradict the testimony of a witness who told the police that he had seen Ball-Bey throw away his gun, run a short distance, and collapse in the front yard of the house. Police sources related the testimony to the St. Louis Post-Dispatch. Jermaine Wooten, an attorney who represents Ball-Bey's family, says family members and numerous witnesses told him the 18-yard-old had been shot from behind, and that he did not have a gun at all. "I told them, 'If you want me to represent you, don't lie to me. Did he have a gun?' And they all said, 'No,'” the Post-Dispatch quoted Wooten. Police chief Sam Dotson said the wound's location neither proves nor disproves the contention of officers at the scene that Ball-Bey refused to drop a gun and pointed it at them before being shot. Dotson said the full account of all the facts in Ball-Bey’s death will be presented to St. Louis Circuit Attorney Jennifer Joyce, who will press charges if she decides that a criminal violation took place. A copy of the police department’s final report will also be sent to Richard Callahan, the US attorney for eastern Missouri. Tensions have run high in the area since last August’s death of 18-year-old Michael Brown in nearby Ferguson. While the official investigation into Brown’s shooting upheld the officer’s account, a Department of Justice probe accused the city’s authorities and police of creating a “toxic environment” through institutional racism. 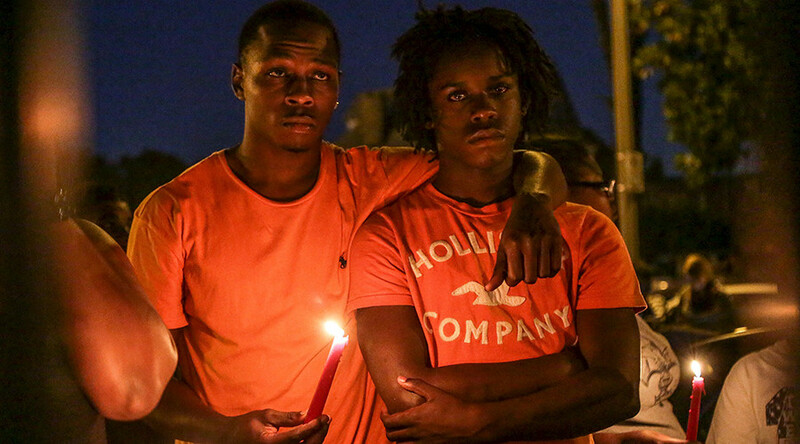 In October last year, an off-duty St. Louis police officer shot and killed 18-year-old Vonderrit Myers. The autopsy in that case showed that six of the eight shots that hit Myers had come from behind. Wooten, who represented Myers’ family in that case, argued that Myers never shot at the officer, or even had a gun. After the police produced a forensics report showing gunpowder residue on Myers’ hands, and three recovered bullets fired from a Smith & Wesson handgun found in his possession, the circuit attorney decided not to press charges against the officer. St. Louis mayor Francis Slay appears to be standing by the police. “The police were in this neighborhood doing their job,” he said at a meeting with a coalition of black ministers in Fountain Park. The troubled neighborhood has a reputation for crime, drugs and violence. A 93-year-old man was robbed on Monday when he stopped in Fountain Park to ask for directions. He had fought in WW2 as one of the Tuskegee Airmen, a famous African-American fighter squadron.